SAP Fiori has simplified the way in which users interact with a variety of applications, especially in SAP ECC and S/4 systems, but until recently SAP Solution Manager was largely left out of the loop. With Support Pack 07 the latest evolution of the SAP user experience is now available across several Application Lifecycle Management functions, providing users with better transparency of their data, greater user satisfaction and improved productivity. 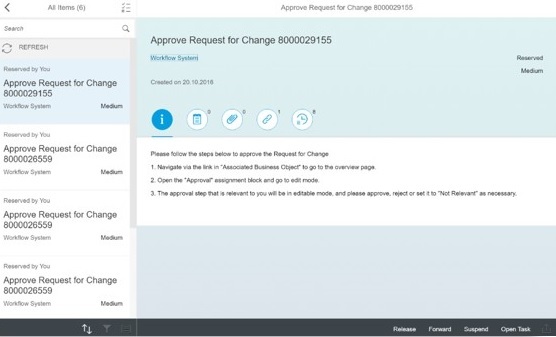 One of the biggest use cases for Fiori in SAP Solution Manager is in support of Change Request Management (ChaRM) – one of the most commonly implemented functions across our customer base. Finally, we should mention the ‘My Inbox’ SAP Fiori application is also accessible via mobile devices running on iOS or Android operating systems. This will vastly simplify the accessibility of your ChaRM solution and allow employees to access their data from any location at any time. Now that Urgent Change approval doesn’t need to interrupt your coffee break! Do you want to know more about how SAP Fiori application can help simplify your SAP ALM processes? Contact us here and ask for a demo.